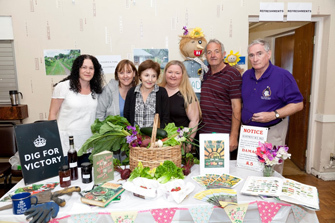 On Saturday 5th July 2014, residents of the Urmston and Partington locality area came out on mass to vote for the projects they wanted to receive grant funding of up to £4000. 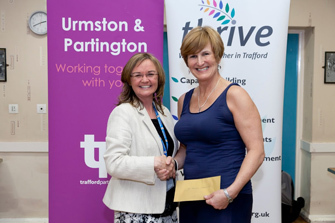 The ‘Have Your Say’ event, hosted by the Urmston and Partington Locality Partnership and Thrive Trafford, gave local people the power to decide which projects would be funded through the Voluntary Sector Grants scheme. 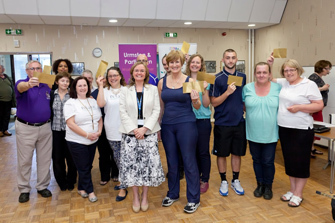 The grant scheme which was launched in May, gave local voluntary sector groups in the Urmston and Partington Locality Partnership the opportunity to develop innovative projects which support some of the area’s key priorities including: ‘Healthy minds, Healthy bodies & healthy eating’, ‘Employment, education and skills’ and ‘Access to the environment’. From the applications received, ten projects were shortlisted to go through to the public voting event. Over 160 local residents came along to the event, held at Partington Community Centre, breaking the record set at last years event. Successful projects were; Hi Tension Workouts – Fitness for Body and Mind; Relate (GMS); Partington and Carrington Youth Partnership; Moss View Allotment Society; ChainLink; Meet & Eat; Soothe Baby Blues and Chadwick Park Allotment Society. For classes aimed to reduce anxiety, enhance mood and improve self esteem, developing both physical and mental health. Our aims are to continue to provide a “Fitness for Body and Mind “class to all those within our community with mental, physical and learning disabilities. 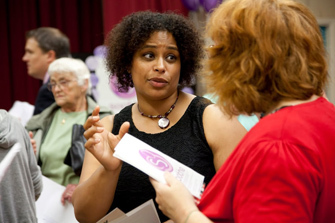 We also aim to empower adults whom feel isolated and lonely too. This group of people, in the main, are not accommodated for. This project allows the special populations in Trafford to experience the many benefits of exercise, well being and socialisation. Due to the success of this group, and the current sessions being full, our new aim is not just to run the existing class again for another year, but to provide a second class per week. Thus creating the opportunity to positively affect the lives of more people within our community. Lets Go Global is a creative media organisation, working across Trafford and Greater Manchester. Lets Go Global has been working in Partington since 2003. Delivering arts & digital media projects at the family centre, youth centre, and more recently at the Library & Wellbeing Centre, in partnership with the Library and blueSCI. Building on this success, and our current digital arts projects Poppy and See it! Say it! Do it! We would like to develop a training programme that will support the people of Partington to become ‘Community Enablers” in the digital realm. The programme will be held in the Library and open to residents and workers from the area, of all ages. It will train people in basic online and creative technology skills to improve employment opportunities and life chances. The training will give participants the skills ready to use for themselves, and also to demonstrate and support others in using these skills, as a mentor and enabler within the library and their own settings. We will recruit people from across Partington, especially targeting those who don’t currently access the library or in social housing but would be interested in knowing more about technology and teaching others how to use it. This project aims to promote a self-help ethos that encourages the children to sample different sports and activities and challenge themselves in learning or trying new Olympic themed activities. The project will offer 13 different disciplines and creates awareness of sports not taught in schools on a regular basis. The project rotates its sports and activities on a 3 week term and helps to keep it fresh and appealing. Each of the 3 Primary schools will offer 20 places each. This will aid in creating friendships and partnership work that would not normally take place outside of school unless it’s of a competitive nature. If our application is successful we will be able to offer Urmston & Partington schools 12 days at no cost, thus reaching at least 1200 children, 36-48 teachers depending on the number of classes per day. This is based on the number of children in each school and the school’s existing timetable and commitments. We also invite parents / carers into the mobile classroom for a short awareness raising session. Moss View Allotments consists of 32 full size plots and is the largest of two allotments in Partington. Some plots are divided into two, and plots are rented to individuals and families from all sectors of the community. This project aims to make Moss View Allotments more accessible to the residents of Partington and surrounding areas by installing a disabled toilet in the community hut and then promoting the new facility. There is a currently a distinct problem with recruiting disadvantaged members of the community onto the allotments in Partington. Having a fully functioning disabled bathroom facility will open the opportunity for more disadvantaged sectors of the community to use and enjoy the green space, learn new skills and feel a part of a friendly group of people. Chainlink is a community group which engages people in cycling in various ways. The Tour de France comes to Britain this year and Britain’s elite cyclists dominate the world on both road and track. Many people in Partington have told us that they have been inspired by this and would love to take up cycling, whether for personal fitness, to get to work or as a low cost alternative to car use. We will engage a Cytech qualified project coordinator who will train and supervise volunteers to repair and refurbish donated and unwanted bikes. Workshops will take place both during the week and at weekends to give everyone an opportunity to get involved. The maintenance workshops will take place at the Partington Library and Wellbeing Centre and will be focussed on giving the volunteers mechanical skills and experience as well building up their confidence to enhance their future job prospects. They will also be a way for people to improve their mental wellbeing by learning a new skill and interacting with other people. The bikes refurbished in the workshops will be used as pool bikes for people to borrow for our bike rides (which we already run) as well as to hire, free of charge, for longer periods of time, either to access work or for fitness for example. Meet and Eat are a newly established volunteer community group within Partington bringing local people together to enjoy a well balanced cooked meal which is affordable every week. To build on social skills, helping them feel part of the community they live in. Giving a reason to get out of their homes, socialise and make new friends.The group of volunteers have been working hard to produce a series of menus, with rotating chef’s and helpers. The process of working as a team and learning to support each other, and listen, has already proved to be a learning process. This experience is invaluable with regards to their recovery pathway and learning how to deal with people in the real world. In order for the group to run we need to secure money for the rental of the Community Centre kitchen and dining room. The rental has been negotiated to a reasonable rate. The small charge to the community for the lunch will pay for the following weeks food but we would like to be able to fund the rental of the room in other ways in order to keep the costs of the lunch at a minimum. Soothe Baby Blues mother and baby groups run 6 week programmes to treat and prevent post-natal depression for up to 10 women and babies at a time. It is an innovative project, launched and run by a registered Mental Health Nurse, alongside volunteers and other perinatal/early years specialists. It is de-stigmatising, accessible, and treats the whole family by targeting the wellbeing of Mums. Soothe Baby Blues teaches ways to overcome emotional difficulties via a guided self help group setting. Many women suffer low-moderate levels of emotional difficulties, and early intervention and support at this stage via SOOTHE Baby Blues aims to reduce the need for more intensive services such as the Perinatal Mental Health Team. The sessions enable Mums to gain an understanding of their emotions, mind, bodies and healthy responses to them; enables women to form supportive friendships; encourages bonding and play. Each group will last for a period of 6 weeks, therefore 3 groups would last for 18 weeks if run consecutively. The Chadwick Part Allotment Society have been working to improve the facilities at the allotment for a number of years. The group are now looking to host a series of open days, events and plant & produce sales in order to build links with the local community. We aim to invite local communities to our allotment site to see what we do. We want to share our aims and vision for the future, showcase what we do in addition to growing and encourage more people to join us. We have taken inspiration similar events at other allotment sites, who have encouraged us and provided valuable advice.